To Pair, Or Not To Pair (in Berlin) ? Ok, so 3 of us met at Berlin’s Ruby meet up – RUG::B, and thought it would be great to do a day pairing. So, a week later after Antonio had booked us in to Factory, we gave it a shot. And were also joined by Manuel, and Alvaro. A mixture of experience levels, but all with some ruby experience. Some with other technology experience. We were four. We could do 2 pairs! I’d been encountering Berlin’s notorious issues with finding accommodation, via AirBnB, and found the search experience not all that pleasing via the main site. Ultimately I wanted a room that was quiet, and had blinds/curtains. Searching for quiet and Berlin on their website does not yield results. Bit frustrating as all the data is there in the descriptions. We tried to see how others would search, and validated that this type of free text search does not work. So, was there another way of searching the AirBnB data? Maybe some people would be inclined to type “site:airbnb.com berlin” into their search engine of choice. But not many, and it was decided that there was still value in a dedicate accommodation search for this type of accommodation irrespectively. So, what was the approach? We could scrape the site directly? Or maybe there was a ruby gem? YES, there was. To the calls of “I bet it doesn’t work,” we quickly installed it. And discovered that of course it doesn’t work haha. Last updated 3 years ago said github, so what do we do? Of course AirBnB had changed it’s structure in the meantime. I’d previously proposed this topic, and written it up as a user story, and proposed that we split into two pairs, to tackle the retrieval of the index of all property results, and the individual property results seperately once we got started. But in the end we persisted as a mob. And all were contributing. I think the first half, was marginally more productive as we had a large monitor in the meeting room. The second half was good, but slightly strained eyes as we just had the one laptop screen. Lunch was around the corner from Factory in a great vegetarian Vietnamese restaurant. Towards the end of the second session, I think we got a little tired, but it still felt productive. We had moved forward on bringing the ruby gem back to life. To improve, I think it would have been best to make the process test driven. But given the variety of experience levels, this didn’t happen, however it is still something we can add to. To finish the day, we all grabbed a beer in Maurpark, in the sun. A new word (score) was established when another friend joined us with better German knowledge: Ein Frühlingssonnenparkbierabend! It was pretty relaxed, but we got progress. An enjoyable day, meeting people more in-depth, and it felt like we actually had the basis of a functioning team, that could tackle alsorts of problems. In the end we have all decided to repeat the process. Who knows, perhaps others will like to join us next time? Perhaps you’d like to message me, if you would like to get involved. 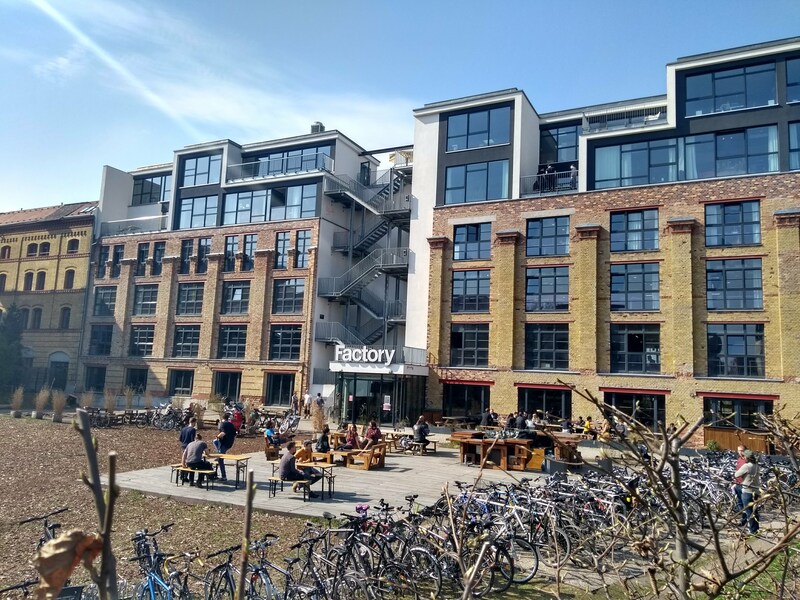 – Great Vietnamese food option near Factory, Berlin. Previous Resuscitating a Ruby On Rails 1 website.